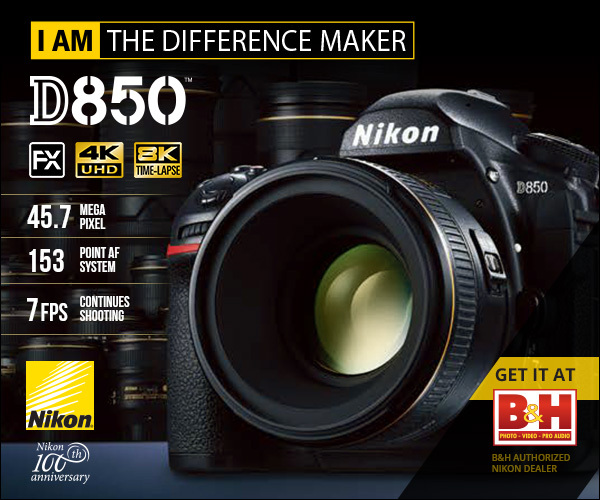 In what Nikon calls "the new benchmark in DSLR image quality", the Nikon D850 is, in many ways, a more compact, more affordable version of the company's D5 flagship DSLR. We'll get into the specifics in just a moment, but this modern, rugged DSLR hangs with the D5 in all but a few key areas... while costing $3,000 less, which makes this camera a bargain for pros and advanced enthusiasts. Even crazier, Nikon seems to be chasing Medium Format users by stuffing a 45.7-megapixels onto this Full-Frame sensor (although I'm sure my Medium Format friends will call shenanigans, still, these files and images are as sumptuous as they are sizeable, to say the least, so it's definitely close to achieving this goal). In fact, given the D850's price advantage, pixel abundance, and speed, the D850 may just have our vote for the best DSLR ever made. If you shoot portraits, landscapes, wildlife, or weddings and other events, you're gonna want to check this out. Of these lenses, the 24-120mm F4 is a must-have versatile lens that will cover most scenarios, but isn't the fastest glass out there and its telescoping design *could* allow for dust and other gritty particles to build up in and around the barrel. Still, with some care, it's an excellent lens. The 70-200mm F2.8 is glorious in every way possible and, with the second version of Vibration Reduction, is awesome at handheld video and low-light shooting. It's PERFECT for shooting portraits or landscapes, but you'd probably want a 300mm+ lens for shooting wildlife. The Fisheye lens does its job well, but for me, was a little too wide below 12mm -- I'm not sure what the purpose of shooting circular images that don't cover an entire frame. And the 16-35mm F4 is another excellent landscape-friendly lens. The takeaway is this: if you buy a Nikon camera, save up for Nikkor lenses. The Nikon D850 boasts an all new 45.7MP FX Format BSI CMOS image sensor (a first for Nikon) without an optical low pass filter (OLPF). Nikon says the BSI image sensor is more efficient, offering more dynamic range and less noise; ditching the filter improves overall sharpness. The EXPEED 5 image processor, from the D5 and D500, is here too, offering speed and excellent ISO performance with a native ISO 64 - 25,600 range that expands to 32 - 102,400. Users can opt to shoot in three different RAW files sizes -- Large (45.7-MP), Medium (25.6-MP) and Small (11.4-MP) -- and in five formats -- FX, 1.2x, DX, 5:4, or 1:1 square -- with viewfinder shading to help frame your shots. I openly admit, these days, to being a bit of a Nikon fanboy when it comes to their sensors, which is crazy because I've never actually owned a Nikon system. Instead, over the last two years I've had the great fortune to test their D5, D500, D7500, D750, D810, and now D850 DSLRs while working here at Steve's and Nikon sensors are, and this is hard to convey in writing, a bit magical. Are they The Best Ever? Who can say, everyone's making great cameras and sensors. But Nikon sensors offer incredible amounts of dynamic range, shadow detail/recovery, rich colors, and, when shooting with fast glass, the closest results I've ever seen to actually shooting with film (in many ways, a LOT better). And the D850 is my favorite so far. Nikon D850 Sample Image Gallery!!! I'm simply floored by the quality and capabilities on display here. Seriously, heap on the superlatives because the dual sensor/processor hearts of this camera are a home run, offering precision, versatility, and beauty at every turn. Photographers must always straddle the line between business and art, and this camera is perfect for working pros who need reliable performance with the flexibility to make large prints. Despite all these extra megapixels stuffed onto a (relatively) smaller sensor (compared to Medium Format), there's little-to-no noise unless you push ISO up towards 10,000. If there's one drawback to having all the pixels you need (and then some), the camera will produce its sharpest, pixel peeping perfection when you're using a tripod. In other words, any subtle movement is magnified. Nikon's VR lenses correct for this, but it would be nice to see Nikon build a camera with in-body image stabilization to allow for more hand-held accuracy. The new Nikon D850 also boasts Nikon's flagship AF system, utilizing the D5's 153-point, Multi-Cam 20K AF system, which features 99 cross-type sensors, 15 of which are sensitive to F8. The center point is actually capable of focusing down to -4EV, which is one stop beyond what the what the 180K pixels RGB metering system is capable of handling. To access & adjust the AF system, tap-and-hold the AF button on the front-left of the body (next to the HDMI port), using the rear control dial to toggle between Single and Continuous AF, and the front dial to toggle between options like 3D (for tracking) and engaging up to those 153 AF points. Much like the D500 we tested last year, if you're shooting through the optical viewfinder, the D850's AF system is a unsheathed weapon ready for shooting sports and moving wildlife action shots. Simply put, if your images aren't coming out as sharp as you want them with this camera, it's probably your fault. (Sorry, but it's true.) I definitely messed up during my time with the D850, experimenting with different subjects and techniques and all in full manual, but this AF system is a dream. In addition to blazing AF capabilities, the D850 can shoot up to 7fps in full res lossless RAW with the standard battery OR up to 9fps with the optional MB-D18 battery grip and the EN-EL18a/b batteries (from the D5). The buffer for continuous shooting is 51 frames of 14-bit lossless RAW capture, 170 frames of 12-bit lossless, and only limited by your memory card when shooting in .jpeg. While the D850 can't keep up with the Sony A9 (or the Micro Four Thirds maven, the Olympus OM-D E-M1 Mark II), it's fast enough to sports and other action scenarios. I had no troubles capturing motocross bikers flying through the air and kayakers diving down rapids. If you engage Live Mode -- viewing and framing via the D850's 3.2" tilting touchscreen, you can shoot SILENTLY up to 6fps at full resolution OR up to 30fps in 8.6MP DX image area mode. This is perfect for wedding or wildlife photographers who don't want to disturb your subjects, but let's be very clear -- Nikon's Live View is NOT a phase detection focusing and it's accurate, but it's way too slow for highspeed action. So, if you're shooting at 30fps, you probably want to lock your focus first, which, of course, reduces this feature's impact and capability. The camera's 180K pixel RGB metering sensor is as accurate as they come, taking into account not just scene brightness, but also how bright each color is in your shot. For those who ascribe to the Sunny 16 method, you're covered. Many Nikon loyalists will tell you to underexpose Nikon shots because it's easier to pull details out of this image sensor's shadows than highlights, and this is true -- there are crazy details in the shadows -- but generally speaking, the camera knows what it's doing. Nikon has also included a Focus Stacking feature, which allows you to take up to 300 still images in 0-30-second intervals, in total silence, at adjustable focus step intervals to help you capture stunning macro and landscape images (but you need to process these in third-party software). Unlike the D810, the D850 forgoes a built-in flash (this was done to help with the improved weather sealing), but you do get support for Radio Flash Control (like the D5 and D500 DSLRs) when using the optional SB-5000 Speedlight and WR-A10 or WR-R10 accessories.